New York City is the most diverse and the most dense city in the world. With apartment buildings littering the city, and literally millions moving from location to location on a given day, one would think New York has one of the most efficient systems when it comes to moving. Any New Yorker will be quick to laugh at such a hypothesis. Joinery takes on a very thoughtful approach in attempting to streamline the process of moving homes and removing all the headaches and shadiness associated with it. 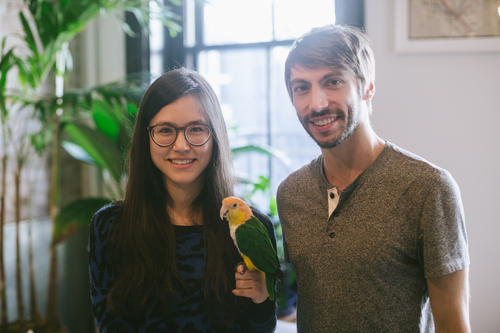 I first met Julia and Vianney, the founders of Joinery, in their bare office located in an unfinished building in the Financial District. It wasn't much, but they had their computers and a phenomenal view from their windows overlooking the Statue of Liberty. In a way, it was an entirely appropriate space for Joinery: their office was as young as their startup, equipped with a tremendous vision for the future. Brian Kil (BK): How did you two meet? Julia Ramsey (JR): We met several years ago while we were both working at Google. We both had a love of cheese and silliness and became fast friends. BK: How did you come up with this idea? JR: Moving in New York is not a fun experience. I remember being new to New York, and being tricked by a broker I found on Craigslist. It's a pretty common story, unfortunately. He started showing me apartments, and I realized he was just showing me no fee places he'd found on Craigslist. He was asking for 15% of a year's rent just for the service of accompanying me to apartments I could have easily found on my own. It was so bleak, and so frustrating. I thought there had to be another way. New York is a very expensive place to live, and a lot of people can barely afford to pay their rent. In this context, paying several thousand dollars to a rental broker is an undue burden. BK: How does it work? Walk me through the process and show me how you are cutting out the inefficiencies. JR: Let's say you know you're moving out of your apartment. You post your place on Joinery and show it to people who are interested. If someone's interested and signs the lease, you're paid up to half-a-month's rent through Joinery's secure escrow payment platform. This is all done with your landlord's blessing, of course. It's as easy as that! All told, Joinery users spend around 6-8 hours on average finding a replacement tenant. This amounts to an average *hourly* rate of nearly $200. BK: Are you trying to replace brokers? JR: We are giving people the option to not use rental brokers. We think that in this day and age, with the widespread availability of information, a lot of people search online and find apartments by themselves anyway. BK: How do you grow from here? What types of new features can your customers look forward to? JR: Our philosophy is that word will spread when people have good experiences -- we are 100% focused on the product. We've done virtually no marketing, so it's nice to see organic growth on our platform. Anonymized text messages. We recently integrated with a service that lets you send text messages using an anonymous number, so you can message people safely and quickly while you're on the go. Tenant pre-vetting. In order to save time for all parties, we have several verification features on site now. So, for instance, if you are looking for someone who makes over 60K, you can filter for someone whose W2 we've checked meets the minimum. BK: What was the most surprising thing you faced as you began fundraising? JR: As a female founder, it's clear in about 30 seconds if a potential VC or angel investor has a gender bias, especially since I have a male co-founder. They'll direct 100% of comments and questions to him. Next, please! BK: For both of you, this is your biggest entrepreneurial project to date. What advice would you give to aspiring entrepreneurs? JR: Always iterate! You really never know what will stick with people.